In 1990 ZENO was collapsing and bassist Ule W. Ritgen hooked up with vocalist Tommy Heart (ex. V2) aimed high together with guitarists Helge Engelke and Andy Malacek plus drummer C.C. Behrens. Signed by WEA they debuted with their self-titled prima opus in 1991. The resy may be said to be history, eleven albums and especially wealthy sales in Japan it seems. Today Andy Malacek is out of the band since the turn of the century, otherwise the lineup seems stable. The band hibernated around 2002, but returned in 2006, and seems to have a lot of mileage in them yet. To capture a career of around 15 active years the band has chosen a massive 32 tracks for their best of. What the “... and More” stands for is up to the listener it seems. They open with a live rendition of “Burning Heart (Talking Ain´t Enough)” from Tokyo (of cause). That is a sure way of bringing the house down it seems. FAIR WARNING is all about sweet melodies and catchy refrains. Te downside of highly melodic metal is that they often slip into a lack of spark. 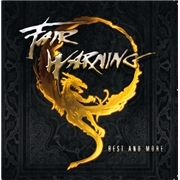 FAIR WARNING is no exception to the rule, and I feel that 25 tracks might have been wiser. They are not poor musicians, definitely not, the lyrics are fine and the audience seems thrilled in the many live tracks. But many tracks seem interchangeable without many noticing, and the elevator music tag is sometimes hanging in the air. Of cause the highlights are there too, “Out of the Night” being the absolutely finest moment. But 32 tracks? And I wonder if they ever wrote any songs for the Eurovision Song Contest? All in all this is well executed but often anonymous.